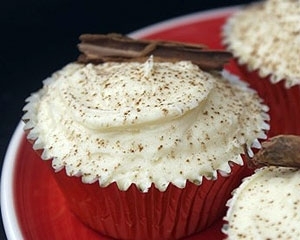 Treat yourself and your friends with the yummy Creamy Eggnog Cupcakes this Christmas. These are easy to prepare cupcakes that will be loved by all, so go for them. · Preheat the oven at 180C and grease a cupcake tray with 12 cupcake cases. · Whisk the butter with caster sugar in a bowl and mix in vanilla extract and beat in the eggs one by one along with some flour. Pour in the milk as well and mix it. · Add in the mixture flour with baking powder, cinnamon and nutmeg and mix it well. · Mix chocolate in this mixture and fold it to distribute equally. · Now, fill the cupcake cases 2/3rd with this prepared eggnog batter. · Bake the cupcakes for about 20 minutes or until they are golden brown on the top. · Let the cakes cool down. · Prepare the frosting by melting white chocolate in a double pan on hot water but be careful. · Now, whisk the butter, icing sugar and double cream and add in it the melted chocolate mixture and mix it all well. · Take the cool cupcakes and top them with this prepared frosting using a small spoon or a pipe. Decorate using ground cinnamon and sticks.